Ricardus I (natus Oxoniae die 8 Septembris 1157; mortuus die 6 Aprilis 1199), "cor leonis" cognominatus, fuit filius regis Henrici II uxorisque eius Alienorae Aquitaniae. Patre mortuo, fuit rex Angliae et dux Normannorum ab anno 1189 usque ad mortem. Ut cruce signatus particeps fuit tertiae expeditionis sacrae annis 1190, 1191, 1192. Guidonem de Luziniano ut dominum Cypri statuit. A Leopoldo V, Duce Austriae, die 20 Decembris anno 1192, post controversiam inter Tertiam expeditionem sacram, Ricardus in vincula castri Tiernstainensis coniectus est. In Europam regrediens captivus Leopoldi V, duci Austriae, fuit et postea imperatoris Henricus VI. Fuit et poeta linguae Occitanae. Temporibus Ricardi regis sepulchrum regis Arthuri Glastoniae repertum esse praetenditur eo loco quem rex ipse Henricus II iam indicaverat. Ricardus in matrimonium duxit Berengariam filiam Sancii VI regis Navarrae. Mortuus (sine prole) Calucae in provincia Lemovicensi sepultus est Fonte Ebraudi. "Riccardo I re d'Inghilterra, detto Cuor di Leone (fr. Coeur de Lion; ingl. the Lion Heart)" in Enciclopedia Italiana (Romae: Treccani). 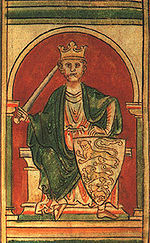 J. T. Appleby, England Without Richard, 1189-1199. Londinii, 1965. James A. Brundage, "The Crusade of Richard I: Two Canonical Quaestiones" in Speculum vol. 38 (1963) pp. 443-452. Jean Flori, Richard Coeur de Lion. Lutetiae: Payot, 1999. ISBN 978-2228892728. John Gillingham, Richard Coeur de Lion: kingship, chivalry and war in the twelfth century. Londinii: Hambledon Press, 1994, ISBN 9781852850845. Rita Lejeune, "Rôle littéraire de la famille d'Aliénor d'Aquitaine" in Cahiers de civilisation médiévale vol. 1 (1958) pp. 319-337. Maurice Powicke, The Loss of Normandy, 1189-1204: studies in the history of the Angevin Empire. 2a ed. Mancunii: Manchester University Press, 1961 (editio prima: 1913). Nelson, Janet Laughland. 1992. Richard Coeur de Lion in history and myth. Londinii: King's College London, Centre for Late Antique and Medieval Studies. ISBN 9780951308561. Novissima mutatio die 13 Martii 2017 hora 04:34 facta.